Eureka, after a long while we can rhapsodize about a New Jersey Indian restaurant that pampers battle-hardened desi palates rather than punishing them with effete curries. Folks, Tawa at 1357 Stelton Road in Piscataway (NJ) is da place for fans of our non pareil Indian cuisine. With curries that sing with flavor, Tawa is a welcome oasis among the endless Sahara of impostors in New Jersey that besmirch the fair name of our favorite Indian food. After a recent meal at Tawa and a revisit to its South Plainfield rival Palace of Jaipur, we’d award higher marks to Tawa. Of course, we’re no strangers to Tawa. Over the last few years, we’ve dined in and even ordered takeout from Tawa on several occasions. And for the most part we’ve had little cause for complaint. Except for one occasion when our eyes fell on a desi waitress with her hand in her mouth near the buffet table, Tawa has mostly been serving decent Indian food (be warned that the Chaats in the evening are bad). Considering how bad most Indian restaurants in New Jersey are, we rendered thanks to the Lord that our recent meal at Tawa turned out to be an embarras de richesse. On a chilly afternoon, the greenish-hued Lemon Cilantro Egg Soup looked enticing and after the first spoon we swooned under the spell of this warm and flavorful delight. Jeera Alu, comprised of medium-cubes of potato with thin sliced ginger seasoning, was a spicy delight whose memories still linger on our taste buds. Makai Mutter Chaman in a medium-thick, light yellow creamy sauce was rightly spiced and easily won our approval. Have it with rice or have it with the hot, fresh Naan bread brought to your table, either way you are a winner. While the Sindhi Kadi was a wee bit high on turmeric, the yummy Paneer Tikka in a orangish medium thick sauce more than made up for it. Channa Masala, which often gets short shrift elsewhere, came with the spices well-calibrated to please. Say, with vegetarian food this good who needs Sukh Sagar or that nearby horror-show Chand Palace Piscataway. If you thought the folks at Tawa shine only on the veggie side, you’d be so wrong. With a dark reddish, thick sauce thrown into the mix, Tawa Special Chicken Biryani is a treat that sets you applauding the restaurant’s solid kitchen. Chilli Chicken (dry), the Lasooni Chicken and the spicy Dahi Chicken added a few notches to the reputation of Tawa’s kitchen. Attuned as we are to invariably receiving bad Indian food at New Jersey Indian restaurants, we were beside ourselves with joy. Alas, the poorly marinated Tandoori Chicken turned out to be underwhelming. Rare is the Indian restaurant in NJ or NYC that serves good Tandoori Chicken these days. Although Sooji Halwa was a teeny-weeny bit low on sugar, it still didn’t disappoint us with the cashew and raisin toppings. Our stiff, unsmiling waiter was polite and promptly filled our water glasses and removed our finished plates. But when we were looking for him to order more Naan bread, we spotted him busy scratching his nose. Overall, its few misses aside, Tawa is one of the few Indian restaurants in New Jersey we’d gladly return to for a meal. Hell, we’re already salivating at the thought of our next visit. 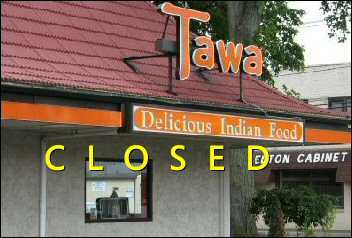 SearchIndia.com strongly recommends Tawa on Stelton Road in South Plainfield (NJ). Mirchi NJ Review – Why Do Such Dumps Exist?